After being unceremoniously evicted from Parliament Square this week, some Democracy Village protesters are showing a marked reluctance to leave by setting up DV MKII on the pavement around the original campsite. MPs, of course, are positively foaming at the mouth over the 'eyesore', suggesting amending legislation and turning the hoses on them, evidently forgetting that the protesters are campaigning for the democracy MPs claim to represent on our behalf. 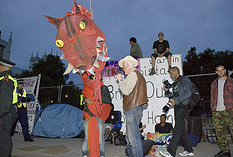 The campers have again joined Brian Haw, who wasn't affected by the recent court decision though the government are hatching a new plot to oust him.